The Hamilton East Public Library in Noblesville will hold a free workshop, "Taking Your Research On The Road," on Saturday, August 10 from 9:30 am to 12:30 pm in the library's genealogy classroom. You'll learn what you can do to prepare before making a trip to a cemetery, courthouse, library, archive or ancestor's hometown. The Indiana Genealogical Society has added the August 2013 issue of IGS Newsletter, the society's bi-monthly newsletter for IGS members, to the Members Only area. IGS members must login to the IGS Records section to download their copy. This issue is full of items from all over the state, including news for 40+ Indiana counties. On Tuesday, August 13, the Indiana Chapter of Palatines to America will offer research suggestions for your German research questions. Attendees can get feedback from a panel of experienced researchers. This session will be held from 6 to 8 pm at the Eagle branch of the Indianapolis-Marion County Public Library. For more information, please see the calendar of events at www.palam.org. My g-g-grandparents lived briefly in Evansville, Pigeon Township, according to the 1860 census. I assume my g-g-grandfather died in Indiana and am looking for his place of burial. My g-g-grandparents were Fred (Frederick/Friedrick) Heitzmann, b.ca 1808 Baden, Germany; Elizabeth (his wife) b.ca 1816/1820; daughter Sophia, b.ca 1853 in NY; son Frederick, b.ca 1851 in NY; son Leopold, b.ca 1857 in NY. By 1865 Elizabeth and the children were living in Buffalo, NY, and she was listed as a widow. They are all buried in Buffalo. Since the children were born in NY, I assume their stay in Indiana was brief. Any help on the burial place of Friedrick, Sr. would be appreciated. The Genealogical Society of Marion County will meet on Saturday, August 10 from 1 to 3 pm at the Eagle Branch of the Indianapolis-Marion County Public Library. Jeannie Regan-Dinius, Director of Special Initiatives for the Department of Natural Resources' Division of Historic Preservation and Archaeology, will present a program about the status of Indiana cemeteries. She will discuss what is being done at various levels to protect and restore them, what we can do to help, and the various state laws that protect Indiana cemeteries. The South Haven Library in Valparaiso will hold a beginning genealogy workshop on Monday, August 5 from 6:15 to 8:45 pm. Larry Clark, head of the Genealogy Department for the Porter County Public Library System and Porter County Genealogist, will be the presenter. This workshop is for people who are just starting to trace their family history, as well as those who are more experienced but who want to get better acquainted with what resources are available in Porter County. This workshop is free but registration is required - to register, call (219) 759-4474. The Northwest Indiana Genealogical Society will meet on Saturday, August 17 at 10 am at the Crown Point Community Library. Linda Swisher, Indiana Genealogical Society newsletter editor and investigator for "Unclaimed Bodies," will present a program on where to find historical newspapers and how they can help in your genealogy research. WAVE 3 News personality Dawne Gee will speak about her genealogical research and DNA findings at the Thursday, August 1 meeting of the Southern Indiana Genealogical Society. Meeting time is 7 pm in the Strassweg Auditorium of the New Albany-Floyd County Library, 180 W. Spring St., New Albany, Indiana. For more information about the Southern Indiana Genealogical Society, please visit http://www.rootsweb.ancestry.com/~insigs/nextmeet.htm. The Wabash Valley Genealogy Society will meet on Monday, August 12 at 6:30 pm at the Vigo County Public Library in Terre Haute. Diane Sharp, supervisor of the Genealogy Collection of the Indiana State Library, will present a program, "Cradle to Grave: Church Records in the Indiana State Library." The meeting is free and open to the public; doors will open at 6 pm. The Indiana Genealogical Society now has 1,097 databases in the Members Only area. Each of Indiana's 92 counties has at least 4 databases. This is a free database - no membership is necessary to view it. It is an index of all the deaths mentioned in the end-of-year issues of the Bloomington Weekly Star, one of Monroe County's leading newspapers at the time. This database is courtesy of Randi Richardson. The Indiana Genealogical Society now has 1,095 databases in the Members Only area. Each of Indiana's 92 counties has at least 4 databases. The Indiana Genealogical Society now has 1,094 databases in the Members Only area. Each of Indiana's 92 counties has at least 4 databases. I am inquiring about my father Glenn Harmon Smith (deceased) ss #314-20-0153; born August 28,1925. His mother was Edyth E. Harmon, and his father was Clover E. Smith. In doing a genealogy search, it shows his residence as Indianapolis Orphans Asylum, East Washington St., Indianapolis, IN. We were always told that he had a "nanny" when he was young, as his mother had to work. My mother is deceased, and my two brothers would like to know if and why he was placed in the Orphans Asylum on East Washington St. He was always very quiet about his past, and it would explain a lot if we knew if this is true. Thank you for your help. The Indiana Genealogical Society now has 1,093 databases in the Members Only area. Each of Indiana's 92 counties has at least 4 databases. The Indiana Genealogical Society now has 1,091 databases in the Members Only area. Each of Indiana's 92 counties has at least 4 databases. The Sons of the American Revolution Genealogical Research Library in Louisville, Kentucky will hold a Veterans Oral History Workshop on Saturday, August 17 from 10 to 11 am. Ron Burkhart (Sgt. Maj. USMC Ret.) will show the procedures to conduct an oral history of veterans, with special emphasis on the Library of Congress Veterans History Project. This workshop is geared toward veterans, families of veterans, history teachers, students, and all those interested in oral histories. Workshop registration is $5 (admission is free for SAR and DAR members, as well as for Friends of the SAR Library). For additional information, please contact Rae Ann Sauer - phone (502) 588-6130; e-mail rsauer@sar.org. The LaPorte County, Indiana Genealogical Society will meet on Tuesday, August 13 at 7 pm at the La Porte City Parks and Recreation Department building (250 Pine Lake Avenue, LaPorte IN). There will be a program, "Genealogy: If you've got questions, we've got answers". Anyone with a question about their genealogy research - whether it's about LaPorte County or elsewhere - is welcome to share their problems (and solutions) in researching their family history. Discovering Local & State Militia Records - Tuesday, July 16 at 8 pm Eastern. This webinar will be presented by J. Mark Lowe, CG, FUGA and will discuss how to find records relating to local militia, which later became the National Guard. Researching in the Post War Records of 1812 - Wednesday, August 7 at 8 pm Eastern. This webinar will be presented by Craig Scott, MA, CG and will discuss compiled military service records, pensions and other War of 1812 records created by the War Department. These webinars are free to the public - for more information, including how to register, please see their blog post. Looking for information on the Catholic Church in Leipsic Indiana. Charles Currier may have attended. He was born in France in 1813, and he and his wife -Verlinda Cain had son William born in Indiana 1872. Seeking information of Raymond Johnson, B abt 1816 in KY; D before 1880? Wife m abt 1845 in KY; Elizabeth (Hopper) Johnson, B abt 1817 in KY, D before 1880? They had 5 children; 4 girls and 1 boy--my Grandfather James Jefferson Johnson. I found all of the children in the 1880 but not the parents. Was wondering if someone will look in the cemetery books of Perry County to see if they are buried in Cannelton or Tell City? The Indiana Genealogical Society will hold a work session for the Hendricks County probate records project on Saturday, July 27 at Plainfield Public Library. 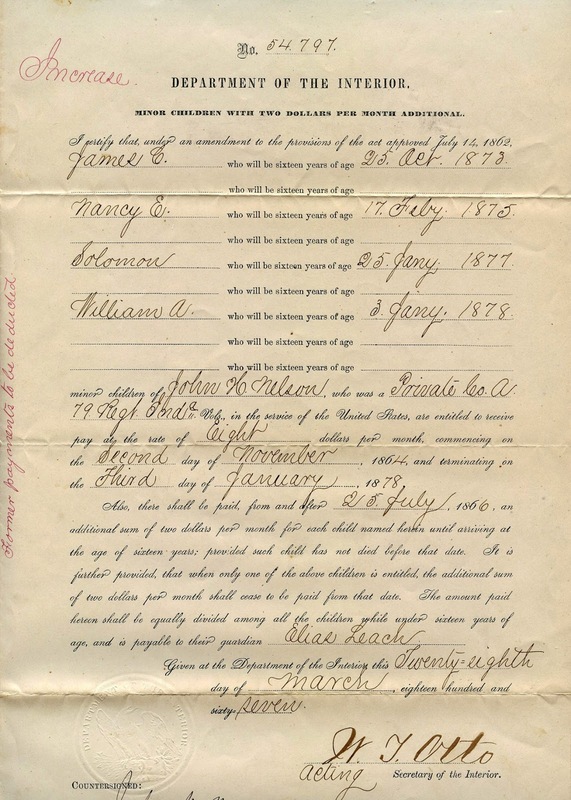 Stop by anytime from 10 am to 4 pm Eastern to help us unfold and organize documents from the 1860's and 1870's, such as this pension application for the children of a Civil War veteran [pictured at left]. 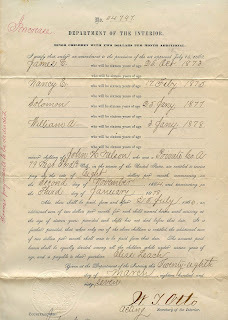 Probate records are among the most detailed of court records and include bills and I.O.U.s. To register for the work session, register online through the library's events calendar, or contact their Indiana Room staff - phone (317) 839-6602 extension 2114; e-mail askindiana@plainfieldlibrary.net. Lunch is on your own, with a variety of restaurant options available in Plainfield. My 5th great-grandfather William Bingham Meade, Revolutionary War Veteran, lived in Mattason(? ), Jennings Co. Indiana around 1836. He lived there with his son; I believe his name was Samuel Meade. Where is a good source of info about them?